Years ago I bought the V1 and for the price I was pleasantly surprised with the size and gentle flying characteristics. The only thing I couldn't stand was the deep trenched panel lines...Looked terrible. But the rest of the bird's profile looked good. Hobby King released the V2 I believe a year or two back and I finally got around to getting one. The upgrades were minimal (different size kV motors is the main thing that I can tell) and the mold and quality is virtually the same as V1 but they definitely improved the panel lines. With the full on arctic blast ("Snowpocalypse" as some are calling it here in the Pac NW) sticking around, today was the perfect build day. 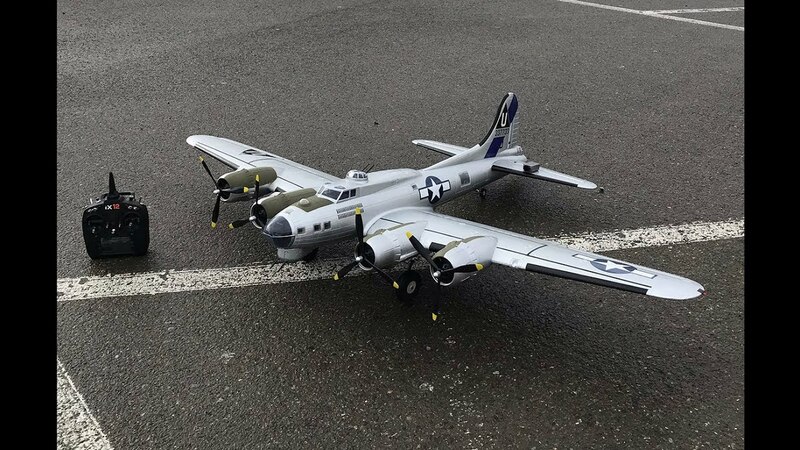 While nowhere near the quality FlightLine would offer a new gen B-17, it still has its place. Great size, looks the part and I am sure it will fly just as good as the V1. Anyone else have one? Now that's a nice looking model! I have V1. Some spare parts are still mostly on backorder (I need a nose cone) but I am hopeful HK will get some in. Its not like MRC. I still am holding out that you guys will come out with one to go with the B24. I like the way it flies but I found the LG mounts to be pretty weak. Is V2 the same or did they improve that? Did the prop n hub mod and repainted to more realistic colors. I still am holding out that you guys will come out with one to go with the B24. You know, I am not actually sure. It looks like the same gear to me but I can't say for certain. That's right George, you're no stranger to this sweetheart. And Ole-Timer, that's right! I forgot about the prop mod. The stock props are so flimsy. that I’ve yet to decide. I take a B-17 to the field every time I fly! The nicest flying Big Bomber out there, but certainly there are better looking. The nicest flying Big Bomber out there, but certainly there are better looking. S.
You wash your mouth out with soup mister. Hmmmm.... I would seriously consider replacing my entire B-17 fleet should Motion come out with a B-17, of this size, and their usual quality! I got tired of waiting for all the snow to melt so I took her to the school for a maiden. Flies precisely how I remember the V1. So docile, so light, just a total pussycat. You can literally throw the batteries anywhere in the battery area and fly...Just a gentle giant through-and-through. Bounced her on the first landing attempt, er I mean, touch-n-go...haha...Less bounce on the second attempt. Landing gear needed some work...Really loosey-goosey...Tightened it all up so should be good to go for the next flight. She looks so sweet in the sky! Nice job! OK next time I want to see the flaps for landing! ha! Every single time time I fly mine, I have to re-tighten the LG mounting screws. If I forget, they practically fall out. Actually, I'm getting tired of that and I think I will use a little Foam-tac to lock them in. I wanted to use the flaps but when I checked them preflight there was waaaaay too much down trim...Not sure why and I was too lazy to change it in the settings so I just flew without them, lol...But wow, the video perspective makes it look like I was coming in reaally HOT but it didn't appear that way to me at all, but then again with the bounce, maybe?? I will recheck the elevator trim settings so I can use them next time. As for the screws, yeah they were very loose after the flight. I think I will do the same thing and use a little Foam Tac on them, good call! Glad she didn't disappoint Todd. Just like the orignal full size, its the bird that just keeps on going.